During the long, cold winter nights I like to cozy up with a hot cup of cider and sit down to watch a movie or read a good book, and to help set the mood (because who DOESN’T take the time to set a mood?) I’ll turn on a nice accent light and let it bath me in its warm glow. 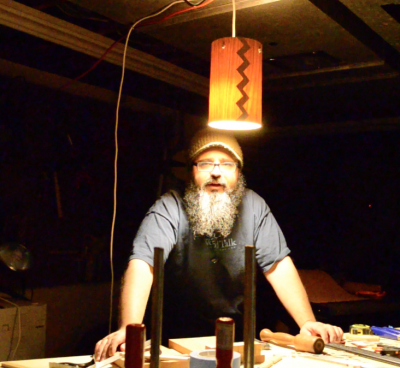 On today’s episode we’re making a wood veneer lampshade for just the kind of accent lighting that I like to use. The project is super simple, and you can batch a whole bunch of them out to be placed wherever you think a little light needs to be cast. The veneer I’m using for this particular project came from the folks at Oakwood Veneer at www.oakwoodveneer.com. It’s a paperback cherry veneer that’s easily bendable and cuts clean with very little splintering. It comes in a variety of species, and we already have some amazing Douglas Fir veneer waiting for another project or set of lights. It’s not only the species of veneer you can experiment with, but also the design of the seam where the two ends meet. In this video I’ll demonstrate how to create a zigzag pattern that looks pretty sharp when the light is turned on, but there are so many options to play with, the choice is completely yours. 10 mil or 22.2 mil veneer from Oakwood? Great idea by the way, and looks great too. I believe this is the 10 mil version. I can’t say for certain since it was early in 2014 when Oakwood offered me the opportunity to try it out. But based on the description at their website, I’m pretty confident it’s the 10 mil version. Hi from Wisconsin! I just watched about 3 hours of your videos and absolutely loved them! I enjoyed the “I love lamp” one best! You are a great carpenter and I enjoy the things that you come up with and make. I love the way you walk us through the steps and what tools and supplies you recommend! Thank you so much for doing this! I really appreciate it and look forward to making this lamp for my husbands “man cave”!! Or maybe 3 or 4!!! Thanks again, Shannon, 36, from Wisconsin!! !